Dublin is both the largest city and the capital of the Republic of Ireland. In the city center, there is a lot to do and see; from galleries to museums; restaurants to pubs and shops. Trinity College Dublin, with the Book of Kells, the Guinness storehouse and Dublin Castle are all within easy reach. Golfing, hiking, hot air ballooning and the beautiful countryside are all available just outside the city. No. 1 international visitor attraction. The storehouse is 7 floors. Visitors will get to see and experience various stages of the brewing process as well as discover the history of this famous beer. 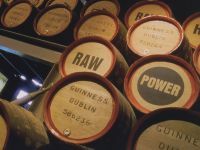 Visitors may also learn the art of pouring Guinness and once they have mastered the craft they may receive a certificate to verify their skills. Open 7 days a week from 9.30am - 5pm (last admission is at 5pm). Late opening during July and August until 7pm (last admission is at 7pm). Closed Christmas Eve Dec 24th, Christmas Day Dec 25th, St Stephens Day and Good Friday. Visitors will see the stages of malting, milling, mashing, fermenting, distilling and maturing whiskey. The journey is completed with a visit to the JAMESON Bar where you can enjoy the ultimate whiskey tasting experience. After your tour, guests can browse through the gift shop or have lunch in the restaurant / bars and enjoy the unique atmosphere. The world famous 16th century Abbey Tavern, a genuine tavern located in the lovely fishing village of Howth, just outside of Dublin. All visitors will feel the warmth of the tavern with its blazing turf fires, original stone walls flagged floors, gas lights and of course a really warm welcome. In The Barn guests will experience a traditional Irish evening, featuring the world famous Abbey Tavern singers and musicians with a lively performance of music, song and the very best of Irish dancing. The Restaurant portion has a warm and unique atmosphere, and offers a tasty menu selection with local specialities from the Harbour each evening. The Pub, one of the oldest in Dublin, is the ideal place to have lunch or just relax for a drink with friends in the genuine old world atmosphere. It is the larger of Dublin's two Church of Ireland Cathedrals (the second of Dublin's cathedral is Christchurch) and the largest church in Ireland. Trinity college, an elite University in Dublin, houses the Book of Kells. The manuscript was given to Trinity College in the 17th century and since 1953 has been bound in four volumes. Two volumes can normally be seen, one opened to display a major decorated page, and one to show two pages of script. It has been on display in the Old Library since the 19th century.